Develop a manual that would allow for state and national program replication. (State of Vermont, 2001). This essay describes the study, called the Moving Ahead Project, and the Community Links program that was developed and piloted based on the findings of that study, including the development of a manual to facilitate the replication of the Community Links program. 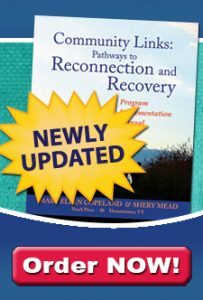 A literature review of the issues of involuntary commitment, mental health recovery, and peer support, including the established values and ethics of these initiatives, a historical perspective of past and current recovery efforts in Vermont and an overview of related mental health programs. A description of the development of the proposal for the State of Vermont to fund the study (Moving Ahead Project) to determine those mental health recovery and peer support initiatives that might be helpful to people who have repeated involuntary mental health commitments. An explanation of the implementation of the study. The data analysis process, an overview of the findings, and the process of using the data as the basis for developing the Community Links program. The design, implementation, and evaluation of the Community Links program. Responses to specific questions posed by Vermont mental health officials and recommendations for future action based on the findings of the study.